Many commercial HVAC customers have critical cooling requirements, including manufacturing facilities, data centers, and hospitals. My responsibilities as a senior technician and troubleshooter include both the central chiller plant control and mechanical systems. On a job recently the installation manager told me something unbelievable. A major expansion was being added to an existing customer: an emergency room addition for a hospital. I thought the chilled water plant was maxed out on capacity as it was. This expansion would impose an even greater cooling load on the system. In fact, the installation manager told me that according to the design engineers the system would operate at over 98 percent capacity on a design day for outdoor air conditions. Those are some very hot, humid conditions. This means that the chiller plant had to operate at almost 100 percent capacity, with no room for error. The very day I started the project, chiller maintenance was being performed because one of the chillers had a major electrical system failure and the entire starter was being rebuilt. I had previously spent some time working on different issues in this chiller plant. One glance inside this chiller plant would show that it was in bad shape. Knowing the mechanical condition of this plant, I knew that probable equipment failure would lead to loss of critical comfort, equipment downtime, and customer dissatisfaction. Chillers. One or more water chillers are used to cool water to approximately 42 to 44 degrees F (5.5 to 6.6 degrees C). This water is then pumped throughout the building, where it is distributed to cooling coils at the air handling units of the building. The water is then returned to the system at about 55 degrees F (12.7 degrees C). The chillers in the plant can be centrifugal, scroll, screw, reciprocating, or absorber types. Centrifugal chillers are the most common type used today. Some chiller plants utilize open, motor-driven compressors. These also need to be aligned properly. Cooling towers. The next major component of a chiller plant is the cooling tower. The cooling tower rejects heat from the building outside. The water entering the tower from the chiller is usually about 95 degrees F (35 degrees C), while the water leaving the tower at about 85 degrees F (29.4 degrees C). There are many variations on this. Most cooling towers utilize one or more fans that bring ambient air through the tower. The ambient air then causes some of the water to evaporate, which in turn cools the remaining water. The operation of the cooling tower fans is vital. Larger cooling tower fans are driven through a shaft and transmission arrangement. The cooling tower fans and motors must be properly aligned as well. If the cooling tower fan fails, it may cause the chiller plant to go down. Pumps. There are different sets of pumps in the chiller plant. Condenser pumps circulate water between the chiller condenser and the cooling tower. While there are variations, many chiller plants are set up as primary-secondary systems. One or more primary pumps circulate chilled water at the plant. In this scheme, if there are 4 chillers there may be 4 primary pumps. In addition, secondary pumps are provided. These pumps circulate water from the chiller plant to the remote buildings air handler coils. It is very common that redundant backup pumps are installed. In any chiller plant, the bottom line is this: You have to have condenser water and chilled water flow in order to start the chiller and provide cooling to the building. If the pumps go down, the chiller plant will go down as well. Anything that affects the reliability of the pumps is a problem. Piping. On the condenser water side, the piping will direct water flow from the chiller to the towers. On the chilled water side, the piping directs water from the chiller to the air handling units of the building. As mentioned previously, if any of the devices fails, the entire plant will go down. It is absolutely imperative that these components be working at top efficiency and at a low failure rate. For installation and periodic maintenance, it is vital that the pumps and cooling tower fans are aligned properly and do not have any unusual vibration. Alignment problems cause failure of bearings, couplings, and seals, as well as high energy consumption and excessive maintenance cost. The facts show that precision alignment can reduce mechanical seal repairs by up to 65 percent, and the rate of pump maintenance is reduced by 30 percent. Also, emergency maintenance costs are reduced. 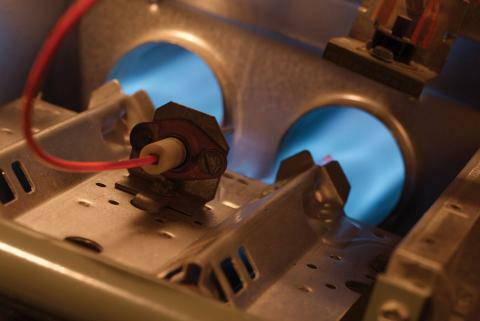 Emergency maintenance can be as much as ten times the cost of proper preventive maintenance on the equipment. Until now, older methods such as a straightedge or dial indicators were used to check alignment. While these methods can be used effectively, they have their limitations and disadvantages. They both take skill and experience to use effectively. In the case of dial indicators, complex calculations may be needed, which can be easily performed improperly. What is needed is an instrument that is easy to use that eliminates the human factor as much as possible. That tool is the Fluke 830 Laser Shaft Alignment tool. 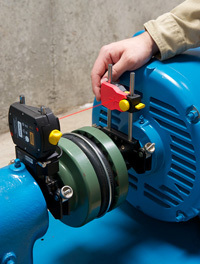 The Fluke 830 Laser Shaft Alignment Tool is perfect for aligning the pumps and tower fans of a chilled water plant. The tool allows simple and effective alignment of the primary and secondary chilled water pumps as well as the condenser water pumps in a typical central chilled water plant. The cooling tower fan drive shafts can be aligned as well. A great advantage is the ease of use of the 830. With straightedge and dial indicators, practice was needed to perform the necessary calculations. In many cases specialists were called in to perform the alignment. The 830 now puts the capability to perform repeatable alignment and measurement into the hands of many more maintenance technicians. Take these three simple steps to use the Fluke 830 Laser Shaft Alignment Tool effectively. Setup. 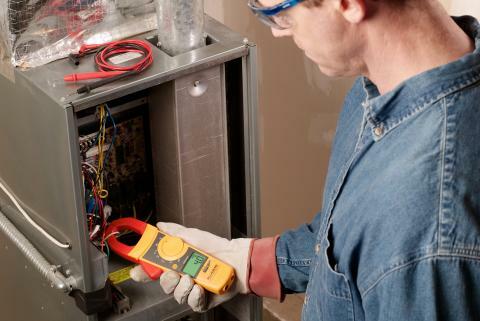 The setup of the 830 is simple, with step-by-step instructions on the meter itself. The instructions are on the multicolor, easy-to-see display. Measure. The meter shows data being collected as soon as the shafts are rotated, indicated by a color change on the meter. In the event that a machine is grossly out of alignment, a built-in extend mode automatically adjusts the alignment area to find the exact amount of misalignment. This removes the need for a rough estimate alignment. Diagnose. Actual correction numbers are generated and displayed on the meter. Again, these are in color and allow you to see the condition of the alignment at a single glance. A set of precision shims are included with the 830. After the device is aligned using the Fluke 830, you can print out the measurements and save them for future use and documentation. As you can see, the Fluke 830 puts accurate, repeatable alignment in the hands of the building maintenance staff and will help keep the chiller plant up and running. Screen machines with the 805 Vibration Meter or an infrared (IR) camera. 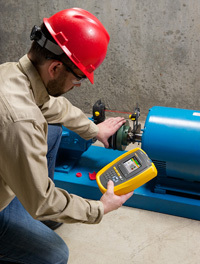 Use the Fluke 810 Vibration Tester to diagnose the fault, its severity, and the repair action recommended. Correct the misalignment with the 830 Laser Shaft Alignment Tool. Finally, check the machine with the 810 Vibration Tester and return the machine to service.